Parquet floors are wooden flooring at its finest. Intricate in their patterns, they open up all properties, be they residential or commercial. They can be constructed from hardwood or softwood, but they bring a completely different sense to a room and need special maintenance to remain as lovely as they are. Preserve the intricate mosaic of your parquet floors for years to come with our service for the sanding parquet flooring – it’ll bring back the shine to your floors! Parquet Floor Sanding in London – How We Perform It? Because parquet flooring is a mosaic, we first need to examine the patterns and see just how the wood has been affected. Many other companies feel comfortable giving you quotes over the phone, but we want to understand the parqueting as is and how the project will shape up. Our goal is to restore your floor to its former glory and this happens through the first-hand examination. When it comes to parquet floor sanding in London, we’re at the top of the industry thanks to our years of experience and high-quality equipment. There is no denying there’s a lot of sawdust created during sanding, but thanks to the sanding machines from BONA that we use we work much faster and create less residue as we work – this is what technological excellence looks like. Our service is geared to minimizing the amount of disruption to your day. Wood replacement: Certain pieces might not fit anymore because the wood has bent from moisture, which is normal for parquetry. We take it upon ourselves to find a suitable wood replacement be it hardwood or softwood. From enormous school floors to the floor in your living room. We can deal with all kind of parquet floors! Gap filling: Sometimes even the smallest gap causes the biggest discomfort. We fill gaps for you using only natural materials. Staining: After sanding, the parquetry takes on the natural color of the wood underneath. We offer unique staining options for this fresh surface any color that you want. Sealing: From oils to waxes, we can finish your floor with any product you desire. 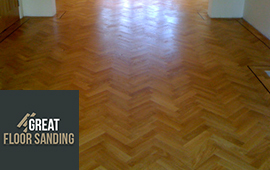 Order Parquet Sanding in London Now! To schedule a preliminary inspection with the sanding technicians, all you need to do is give us a call at 020 3404 9697. All lines remain operational throughout the week, including at the weekend and on special holidays. We provide a flexible service which is available whenever you need it most. Our operators are happy to answer all questions about the service and to help you find the most optimal appointment time to meet your needs.